Yes, I trekked out to Liberty State Park, NJ to see the spectacle on Sunday night. I had to walk a mile or two on a near-deserted non-lighted road in the middle of the park, get drenched to the core by icy rain, and get a talking to from the Park police for crossing some restriction tape, but it was worth it! It was only myself and the crazies...meaning other ship fanatics (mainly Germans). 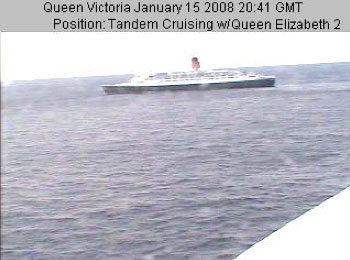 For those of you who haven't had the pleasure of hearing my dissertations on the awesomeness of ocean liners, let it suffice to say that they are close to my heart; AND I was at the christening of the Queen Mary 2 in Southampton, England on Jan. 8, 2004.